Anyone that owns an OTTB – off the track thoroughbred – knows about PTSD in horses and the flashbacks from a racetrack past. The announcer and the show’s PA system is a heart pounding reaction that says “in a few minutes, you’re running with a pack of equine locomotives.” Not just the main ring announcer, but it’s from the schooling ring, the barn calls that send OTTB’s quaking in their horse shoes. They hear that twenty-minute barn call and they are sure they’re saddling up in the paddock for Race 3. Racehorses need to be desensitized to the sounds of the horse shows. 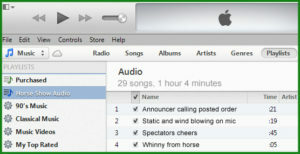 My OTTB needed an iPod or CD with a Playlist of horse show sounds. So we created one that he now listens to at home. I expect this won’t prevent all of my thoroughbred’s nervousness but these sounds are surely more familiar to him at his next horse shows.